The Akka knows everything. 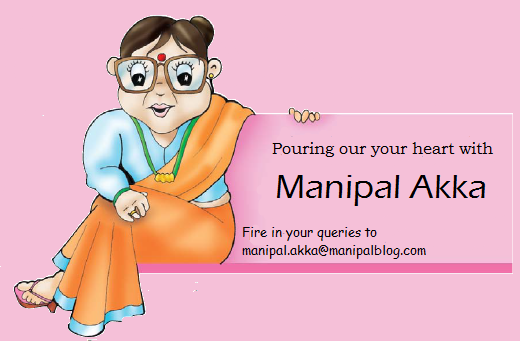 Last week, we carried a Manipal Aunt feature, where she solved our readers problems. Due to popular demand from our fans, Manipal Aunt will now be called Manipal Akka, and she will be answering queries under that name henceforth. She has also put on a new AVATAR as you can see with the picture next to this article! I am a teacher (male, 30 years old) at one of the colleges in Manipal. Even though we have not talked, I am deeply in love with one of my female students. As a teacher, I have a constant fear of tarnishing my professional dignity. Nonetheless, I want to marry her. On the other hand, my parents have insisted that I marry a girl they have found for me, but I have not told them about this. I don’t want to marry another girl. What should I do? You are simply fantasising. How can you fall in love with a person (who seems too young for you anyway) and say you are going to marry her without ever talking to her? Before you jump to any conclusions about your future, you should at least speak to her first. But you must also keep in mind that you are her teacher and she might not reciprocate the same feelings for you, so you must respect the teacher-student relationship, otherwise you will risk your career. Perhaps you should wait until she is no longer your student before pursuing this further. If she then accepts, good for you, you can talk to your parents about the girl. If she refuses, then you should get over her and consider your parents choices as well. Till everything is sorted out, please read one of the posts on this blog What is love? Are you in love? How do you know when you’re in Love?. pals. I am very nervous. Can you give me some idea on how to act with my new friends? Please help. When I was in school, there was this cute guy who loved me like I was the only thing in the world that mattered. Whenever I entered the class, he used to give me that winning smile. It always made my day. But I never returned his smile, nor ever considered his affection. How I regret it! Two lessons. One: If someone likes you or is your real friend, you will NEED that person at some point in your life. There are very few people who like you the way you are. So keep in touch with your dear old friends. Two: Smile. It never hurts. Life is about moving on and you should too. At your old school, you seem to have made lots of good friends. Now that you are joining a new college, you are bound to miss them. But this is how life works. Your new college offers endless possibilities. Start afresh, participate in extra-curricular activities and study hard. Increase your horizon and learn new things. And just be yourself. If you stay true to yourself, you need not go looking for friends, they will come to you.